When 'current' year in the Custom Settings Editor = plant 'Intro Year' they display as new. Easily control key variables to expedite creating and updating your plant library. What's New? It's easy for your customers to answer that question on your website by setting the current year and using that year as the 'intro' year in the appropriate plant records in the Plant Database Manager. 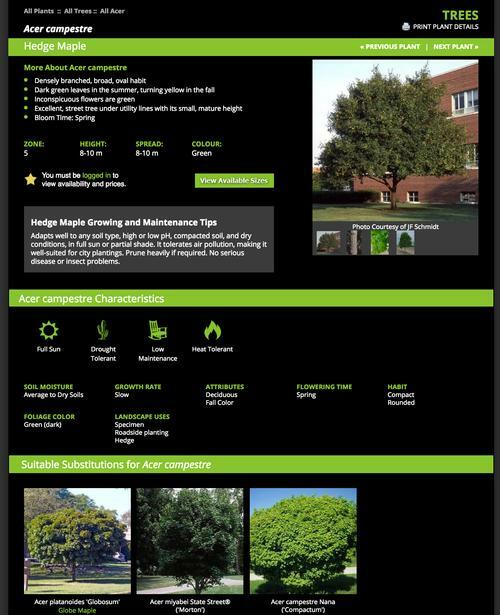 You can quickly call attention to new plants with a graphical 'new' banner as well as having a “New Introductions” section of your site. Plants with the current year can automatically be displayed on that page. Additionally, a 'New' graphic can display on both the plant listing page as well as the plant detail page. You can switch the “current year” manually as soon as you know know the new plants you will be offering in the subsequent year. Typically you would swtich the current year to the next calendar year at some point in the fall. On the GENERAL tab of your Plant Datbase Manager, you can indicate which year you first offer a plant with the 'Intro Year' option (see image 5 on this page). The plant will be considered 'new' when Plant Intro Year = Site Current Year. You can control what letter of the alpha index is the default value that will be automatically used whenever your main plant page is displayed. If you have more than a few hundred plants, we would suggest you do NOT use 'All' as your selection as it will take a moment for the page to load. Be sure the text you enter in the box matches the selections on your alpha index bar exactly. In most cases this would be yes. 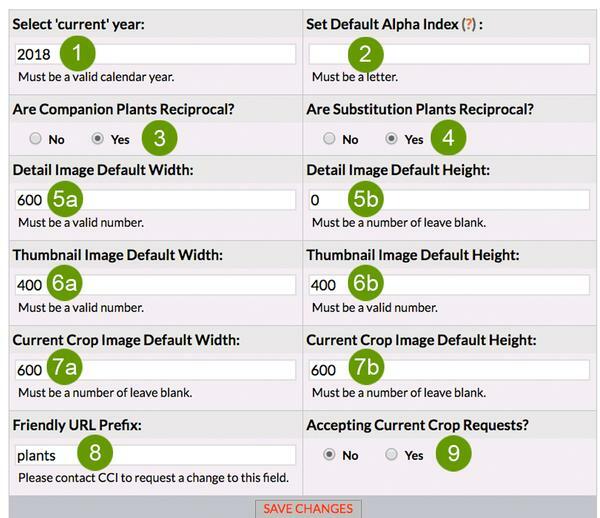 By selecting yes, once you select ‘B’ as a companion to ‘A’, than ‘A’ is automatically a companion to ‘B’ and will display on ‘B’s’ plant detail page. Typically this is set to no. Substitution plants are usually used when the original plant is out of stock or no longer offered. For example you might want to have Echinacea ‘Dixie Sun’ as the recommend substitute for Echinacea 'Daydream' when Daydream is sold out or you are no longer carrying it. By leaving this setting as 'No', then 'Dixie Sun' will NOT display as a substitute on the 'Daydream' plant detail page. You can set the default pixel width and height for both the plant detail images and the plant thumbnail. As long as you upload an image larger than those dimensions, the Clarity ImageMagic&trade; will size them based on the values entered. Having appropriate values wil provide consistency to your page layouts. Based on the approved design, we will enter the appropriate pixel width dimension. Having appropriate values wil provide consistency to your page layouts. Based on the approved design, we will enter the appropriate pixel height dimension. Having appropriate values wil provide consistency to your page layouts. The Current Crop Editor is a great tool to help promote your 'wow' plants and easily add current crop photos to specific varities and sizes. Typically 'plants' is used, but if you offer a focused line of plants, we may want to switch it to something more specific like 'roses' or 'grasses'. If there is a dormant period in your growing season, you can turn off the option for your customers to request current crop photos from your website.